Floor EdgingTM and Control CavityTM feature MTI’s slipsheet technology. Together, they form and separate concrete from other construction details and restrict temperature and moisture transfer keeping moisture that forms on walls via condensation or moisture that’s forced through walls by pressure to move down the wall and between the wall and the floor and into the drain field/drain tile system. This moisture is then transferred to the sealed sump basket/sump pump system and transferred out of the below grade (basement) living space. 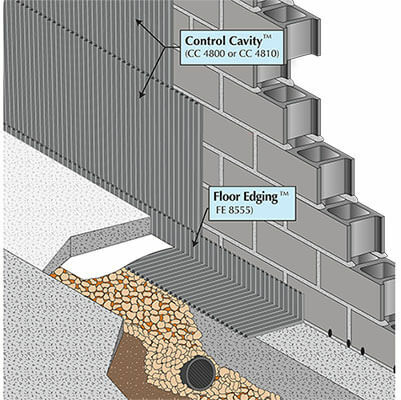 MTI’s Floor EdgingTM, Control CavityTM and our sump basket products have been successfully used in thousands of homes and commercial buildings to resolve the toughest moisture challenges. Floor EdgingTM and Control CavityTM are made from 100% Post Industrial Recycled Material. Shortly after closing on a house, the new owners discovered water intrusion problems in their basement. They were unable to solve their problems with changes to the exterior so they contacted MTI. After viewing MTI details and animations they contacted a local contractor who installed a sump system, MTI Floor Edging™ and a drain tile system. Here's what they had to say about their experience. "We were shocked when we started experiencing water seepage at the base of our basement walls within days of closing on our new house. 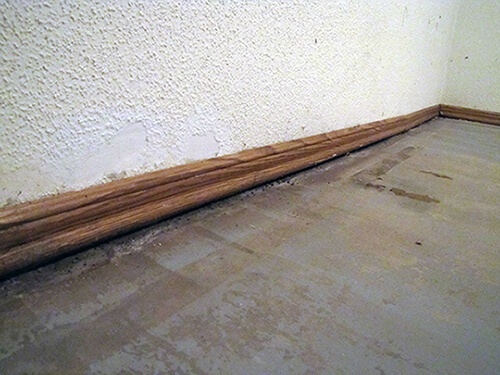 It destroyed the carpet and was damaging the drywall and baseboards. We tried several solutions but nothing helped. A local contractor installed MTI's Floor Edging and sump pump system and we haven't had a problem since! We now have a dry basement with room for the kids to run around and a safe place to store our belongings."